You will receive a $50 voucher for $25! You may only use ONE $50 voucher per visit, per family. Taylors Falls Recreation will not allow you to use more than one voucher per visit. You will receive one $50 voucher with this promotion. Wild Mountain, a Minnesota ski area is located seven miles north of Taylors Falls, Minnesota along the banks of the serene St Croix River. Less than an hour’s drive north of the Twin Cities takes you ‘Just North Enough’ to a winter playground where family and friends are able to enjoy a day of fun together. With 26 runs traversing 100 acres of snow covered terrain, skiers and snowboarders of all ages and abilities enjoy the great outdoors in Minnesota. Wild Mountain Waterpark, Alpine Slides and Go-Karts; is an outdoor summer recreation area for all ages. Located just 7 miles north of Taylors Falls, MN, it makes us close enough to the Twin Cities for a day trip, or a weekend get-away! Our outdoor park is set in a rural area in the St. Croix River valley, and there is plenty of free parking, picnic tables in the shade, and grassy areas to bask in the sun. Wild Mountain’s outdoor recreation area has several large waterslides, a lazy river, kiddie park, wading pool, tipping bucket, water playground and more to keep you cool on a hot summer day! On the dry side, you can race around the go-kart track, or take the chairlift to the top of the mountain, wind down the 1700’ long alpine slide track back down to the bottom. Throughout the park, there is also volleyball courts, and horseshoe pits, shade tents and clean restrooms and showers. Skiers and Snowboarders of all ages and abilities come to enjoy our winter playground with its mix of terrain from novice to expert. With 26 trails spread over 100 acres, including four terrain parks and a novice discovery area, it’s a great place for families and friends to enjoy the season outdoors. Wild Chutes Snow Tubing is a fun family adventure. Get the thrill of cruising down one of our specially formulated tubing lanes alone or with a group of friends or family. Getting to the top of the hill is effortless on our conveyor lift. 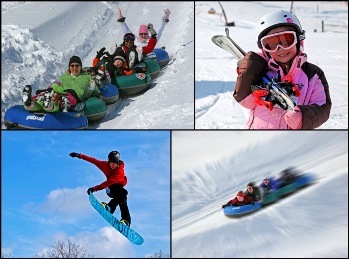 There is exciting family FUN for all at Wild Mountain and Wild Chutes! Make sure to check out our website and join Wild Mountain on Facebook or Twitter for updates. Also check out Wild Mountain on Instagram! Not valid with group rates or any discount or coupon. Not valid for season pass sales or birthday parties. Not valid for food service. Wild Mountain will not allow you to use more than one voucher per visit. Up to one (1) voucher may be used per visit, per family. Voucher cannot be used online. Valid only at Wild Mountain, 37200 Wild Mountain Rd. Not valid at any of the other affiliated organizations.